Perhaps one of the best kept secrets about adoption is the support available to us in this rich and diverse community to which we belong. A friend and fellow adoptive parent once said, "Our family has been introduced to a whole new world that we would have never known existed had we not adopted." Some of the bravest, most inspirational people I've ever known, I met on this journey. Early on, while still enrolled in the Taiwan program, I was invited to join a group of women who were exploring the darker issues in adoption. Issues like loss, corruption, fear. In the context of a private blog, it sunk in deeply that adoption always begins with loss. Adoption is not a fairytale, no matter how convincing those 'first meeting' pictures may look. My perspective was forever altered. When we changed programs to Ethiopia, my fellow adoptive parents were there to guide us. Some gave us advice on compiling our dossier. Others helped us prepare for travel. Some encouraged us as we waited not-so-patiently for a court date. Others listened and offered suggestions as we made our way through the labyrinth of transitioning home. With some of these families, we developed long-lasting friendships. Others were in our lives for a short time, but exactly when we needed them. All of these families were weaved into the fabric of our story. 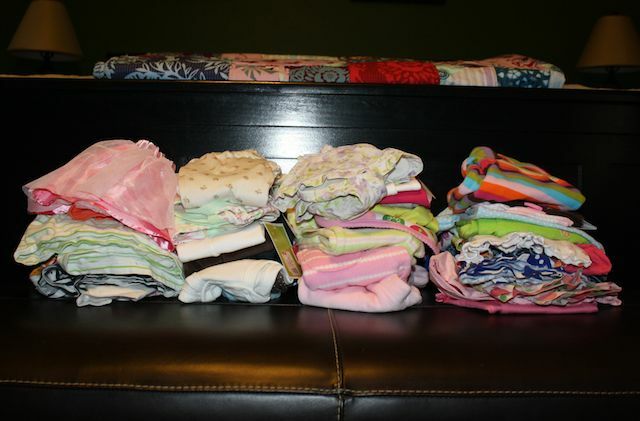 Recently a friend from the adoption community mailed two boxes filled with the fabric of her story, literally. 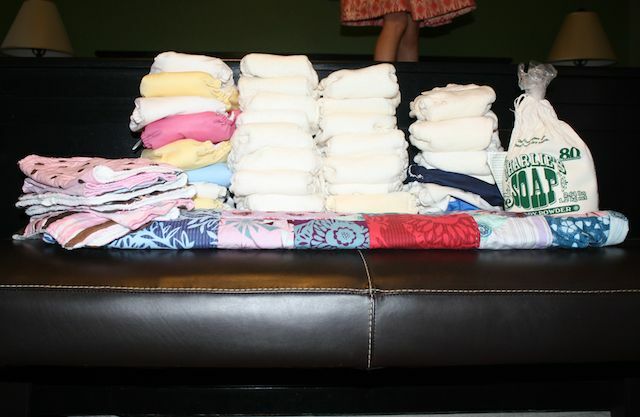 One box was stuffed full of brand new bamboo cloth diapers, along with some gently used all-in-one diapers and laundry soap. Another was filled with baby clothes, most with the tags still on. 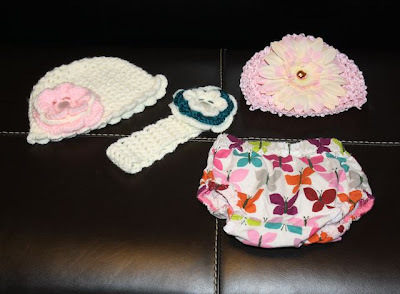 She included some handmade items, too. Items that ended up being too small to fit her little one. The fabrics inside these boxes were the physical manifestation of one adoptive mother's dream to have her daughter home and in her arms. She bought these items in anticipation of her daughter's arrival. But as the months dragged on and her daughter grew in the arms of another, they served as a reminder of hope unfulfilled. Eventually, after months of waiting for a court date and embassy approval, this family was finally able to bring their daughter home. In all of this, they thought of us not only when they traveled for their court date, but again when they went back to Ethiopia a second time to be united with their daughter once and for all. 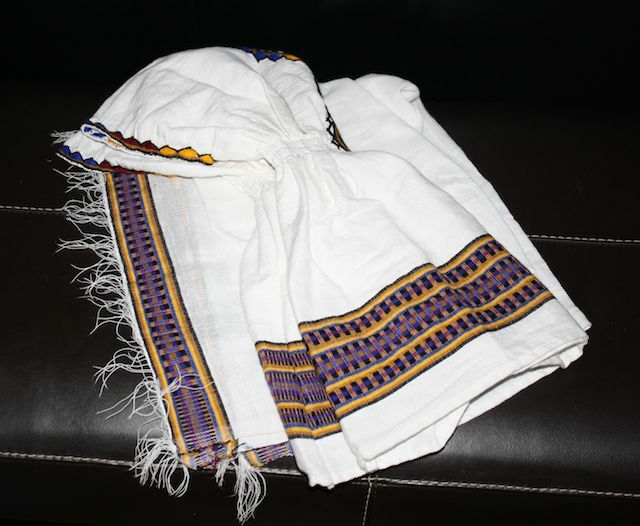 This time they brought back this traditional Ethiopian dress for our new baby. They wanted each of our children to have a traditional Ethiopian outfit of their own. Now, having been home for several months, they have come to see the ways in which the timing of their adoption was just as it was supposed to be. They learned the hard lesson of surrender that the adoption process seemed determined to teach us. With that perspective, along with the knowledge that we were starting again, she decided to pass along all of this goodness, and all that it once represented, to our family and our new little one. She included with it a handwritten letter which described the emotions that these items held for her in their story. We were overwhelmed by her generosity and thoughtfulness. We try not to hold onto more than we need. She had given so much that we were able to pass some of it along to the young moms at the women's shelter where I work. When the moms with baby girls saw these new gorgeous clothes, clothes that they could never afford, their eyes lit up and smiles spread across their faces. These two boxes blessed so many. Oh the goodness of this community! And how very grateful I am to be a part of it.